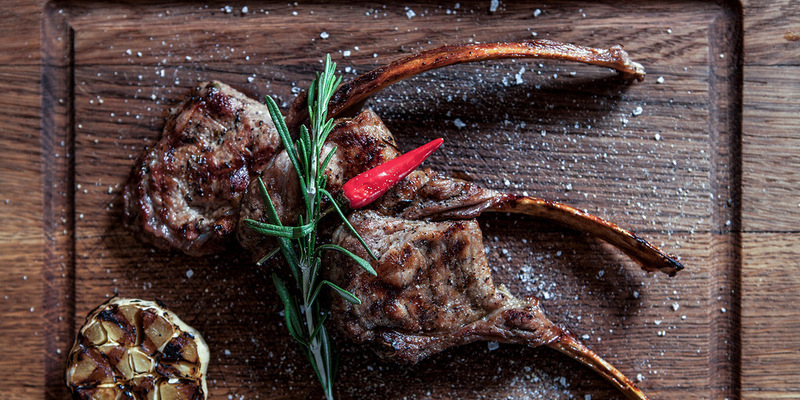 Do NOT trim any fat from the lamb racks. Lamb has several layers of membranes. Peel 3-4 of these off so that the seasoning and smoke will better permeate the meat. Crush the rosemary in a small food processor or mortar and pestle. Mince the garlic with a garlic press (or use equal quantity – 4-5 tablespoons – of minced garlic from a jar). Make a paste with the olive oil, garlic, rosemary, salt, and pepper. 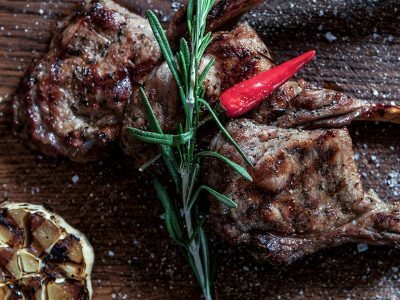 Use this paste to coat any part of the rack of lamb that is not covered with fat. Sprinkle salt and pepper on the fat cap on the top side of the rack. Set the grill to 205°C. Grill the lamb for about 12 minutes per side or until done to your liking. This method should get cooked to medium-rare only, but suit yourself.